Get rid of a few eggs and evict the peanut butter and before you know it a kid thinks he’s king of the cupboard by the time he’s in kindergarten. Such was the case with Big Guy, whose control-freak nature was leading him to be a bit over vigilant about food safety. “It’s OK,” I said, shooting Big Guy my Mean Mom glare. “The only thing that can hurt him second-hand is peanut butter.” She was too guilt-stricken to continue, though. A few weeks after that, Big Guy spied Lunchables at the grocery store and wanted one with ham. More accurately he wanted one with chocolate pudding, which just happened to also include ham. “OK, you can have it, but remember I’m allergic to pork. That means I can’t share it with you,” I said. He grabbed it without a moment’s pause, though he was back on the “you can’t eat that. I’m allergic” bandwagon the next day when Boots wanted cookies at a friend’s house. I had had enough, but I had to wait for an opportunity. In the early days, purging the house of everything Big Guy was allergic to made sense. It kept baby-sitters from having to figure out what was safe for him to eat, and it lessened the stress of cleaning the kitchen to operating-room standards to ensure that his food didn’t become contaminated with something that could harm him. Back in those days, his egg allergy was much more severe – his first attack came after consuming a small amount when he was 10 months old. We had to call an ambulance. He tested positive to the white and the yolk, which is rare. Most people are allergic to the white only. 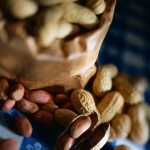 His peanut allergy was severe from the start and remains so. He’s contact allergic, meaning someone who ate peanut can touch something and if he later touches it he will break out. Somehow, though, our vigilance about peanut butter translated in his head to “no one can eat anything I’m allergic to if I’m within 10 miles because I might get sick.” Or maybe he just enjoyed verbally smacking people. Either way, it was getting tedious and rude. It’s also the kind of behavior that gives people with food allergies bad reputations for thinking the world always should cater to them. It came to a head while we were on vacation. Big Guy had spent the whole day sulking over salsa and barking at anyone who ate ketchup. Dad ordered fajitas that night – a chicken, shrimp and beef combo. The next morning at breakfast, he decided he wanted to try bacon. We’ve now successfully renegotiated the rules. At restaurants, anyone can order whatever they want regardless of anyone else’s food allergies. Pizza is the one exception: Big Guy loves it so much Dad and I agree it would be cruel to eat it while he goes without. We’ll continue to take “his” food when possible, and I’ll eat his egg-free sweets right along with him. I’m also mildly allergic to egg, so that makes sense. But the days of “You can’t eat that. I’m allergic” are over. Even Big Guy saw the wisdom of that after he scarfed plate after plate of bacon that morning while my mouth watered.